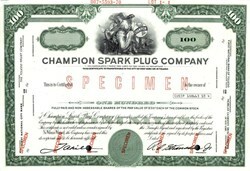 Beautifully engraved specimen certificate from the Champion Spark Plug Company printed in 1970. This historic document was printed by the American Banknote Company and has an ornate border around it with a vignette of an allegorical woman next to the company's logo. This item has the printed signatures of the Company's officers (Robert A. Stranahan Jr. as President). Champion is an American brand of spark plug. Originally Champion was a Fortune 500 Company founded by Robert A. Stranahan and Frank D. Stranahan in 1908 in Boston and then moved to Toledo, Ohio in 1910 to be close to the Willys-Overland Auto Company. In 1989, Champion was purchased by Cooper Industries and is now a wholly owned brand of Federal-Mogul Corporation. Its main products are a line of spark plugs for a wide range of cars, trucks, SUVs, racing and marine applications. Also included in the brand are spark plug wires and other ignition system specific wiring.